Ready to add some pizzazz to your table or wall? Make it in colors to coordinate with your favorite dishes. It's quick and easy. Finished size is 60" square. Just for fun, use fat quarter to zip up this easy Table Runner and Placemat combo. One coordinating print for the borders ties everything together to perk up your dining room. Includes Table Runner (17.5" x 38") and Placemats (14" x 18"). Decorate your bedroom with a new color scheme in this snappy quilt design. Make this quilt center using a speedy-piecing method for traditional-looking Good Cheer Blocks and alternate x-tra Blocks. Then add borders to make one of three sizes to fit your needs. Finished sizes: Throw quilt is 68" x 80", Double is 78" x 90" and King/Queen size is 95" x 107". This wall hanging can be out all year long, depending on what the occasion is for decorating. It couldn't be more perfect for Valentine's Day - unless it's for the Fourth of July. You can accessorize this project with beads, buttons, fringe & ribbons. Let your creativity show through! The flag can be made as its own project as well. Finished sizes: small heart is 15" square, large heart is 26" square and the flag is 8" x 10". Everybody loves hearts - whether it's Valentine's Day or not. Putting this quilt together will be a work of loe for someone special. Use their favorite colors to tell them how much you love them. Finished size is 64" x 78". You can almost feel the salt breeze from this whimsical wall hanging of sailboats and ocean waves. The red, white, and blue colors add a patriotic flair to the scene. Use fabric from your stash to this scrappy ocean scene and you're ready to sail off to faraway places. Finished size is 38" square. A new baby is the perfect excuse to make a new quilt & this Little Charmer is just the answer! Measuring 51.5" square, your little charmer may need blue prints instead of pink, but either way you'll enjoy putting together this pieced quilt to help warm up your new little bundle of joy. There will be smiles all around with this Little Charmer quilt! Need a big quilt to snuggle? You'll be able to wrap yourself up in this cozy comforter. The center of the quilt is a giant traditional block called Mrs. Keller's Nine Patch that goes together in a hurry. With large pieces in the quilt center, pick a stunning floral print to showcase in this quilt. Finished size is 93" square. Grow your own Petunia Patch indoors at your sewing machine & quilt it up in no time. Get out the scrap bag to mix & match your petunias or make yours all the same color. Have fun, but watch out for bees! Finished quilt measures 73" square. Have you a got favorite print fabric that you really want to showcase? Use it in this pieced quilt for everything except the blocks, the accent border & binding. Or you could have the alternate blocks contrast with your border fabric. Let your imagination run wild! Finished quilt measures 49" x 61". Put "Pumpkins All Around" the house with these quick and easy autumn projects. Whether in the kitchen or the entry, you can use these quilts to decorate the house for fall parties and get-togethers. Includes Table Runner (23" x 37"), Wall Hanging/Candle Mat (26" square). This traditional block goes back to the 1930's, so it's nothing new. The colors & the backgrounds bring life & vibrancy to this quilted creation. Make it extra snuggly using plush flannels. Mix plaid, stripes & a floral to make this scrappy, but planned color scheme. Finished sizes: crib quilt is 38" x 50", Twin quilt is 62" x 86" and Double/Queen quilt is 86" x 98". Scrappy Kansas Troubles is an old favorite that brings tradition & comfort to any room, whether it's on a couch, a table or a bed. So be creative! Measuring 76" square, this pieced design is the shower curtain (with a vinyl liner) in the guest room at my house. Mix vintage prints with batiks, choose fabrics from your stash or have a field day coordinating the newest lines - anything goes for Scrappy Kansas Troubles! If you love traditional quilt patterns, then Spinning Wheels is the quilt for you. Measuring 52" x 70", this pieced design uses two colors, two blocks & a unique border to create a quilt that is also traditionally easy. You'll love having this throw quilt in any room of your home! Imagine a stained glass window of tulips along a garden path and that's just what you'll hae with this quilt. Make the large quilt for a spring fresh throw or the small quilt to create a stained glas window for any room. Finished sizes are 43" or 65.5" square. Travel back in time to the 1930's with our Time Piece quilt. Measuring 86.5" x 92", this fat quarter friendly design uses popular reproduction fabrics of the 30s in a broad array of colors & prints. Even if you choose to use your own favorite prints instead, this simple pieced quilt of colorful bowties will capture your time & everyone's attention! Need a decorative quilt to set the holiday mood for a big family dinner? This is it. Using Quick fuse applique techniques, this can be on a wall in less time than it takes to fix that Thanksgiving feast! Finished size is 24.5" square. Do you love summertime & seeing windmills spinning in the breeze? Then Whirling Whirligigs is the quilt for you! 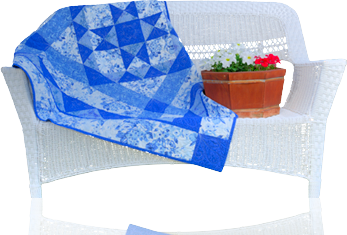 Measuring 65" square, this pieced quilt makes a great table cloth or picnic quilt, though you may just want to hang it indoors to help set that summer mood. Gather up some stunning colors to make these whirligigs spin & surround them with some beautiful border prints. Wherever you decide to use this bold & beautiful quilt, you'll enjoy stitching it up in a jiffy! Get out your favorite scraps to create this gaggle of gesse! Using pastels or primary colors, this is a cheerful lap quilt for the couch or the foot of the bed. Just don't let their honking keep you from snoozing. Finished size is 64" x 84".